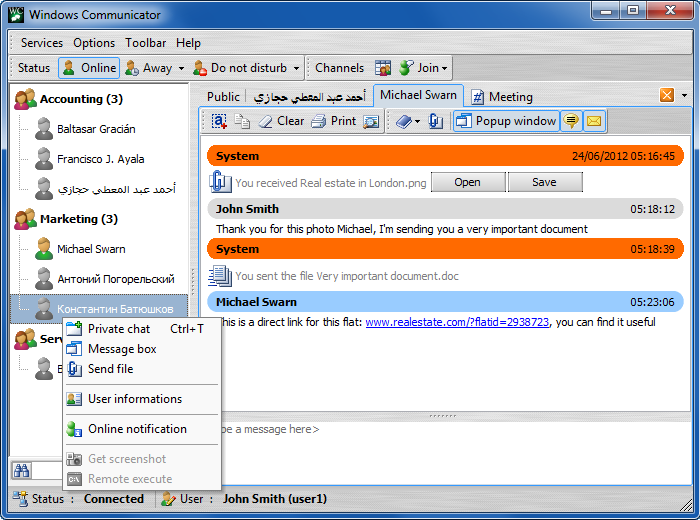 Windows Communicator is a cross-platform messenger that combines the advantages of desktop applications and web communications. The application allows for private conversations between employees of the company, public talks, conversations in chat rooms. The administrator can give users the right to collect screen shots, remote start programs. Windows Communicator users can transfer files between them, even in offline mode (the user receives the file by logging into the system). The system administrator configures web chat: sets company working hours, number of concurrent web connections that an employee receives, the message out of working hours, there are no free agents to handle queries.